Westlake Homeowners Association Open Spaces Liaison Tom Berridge is looking forward to the time when he can peer into the 17-acre oak woodlands that borders Kruse Way in Lake Oswego and see an eclectic variety of species instead of a dilapidated habitat suffocated by ivy. 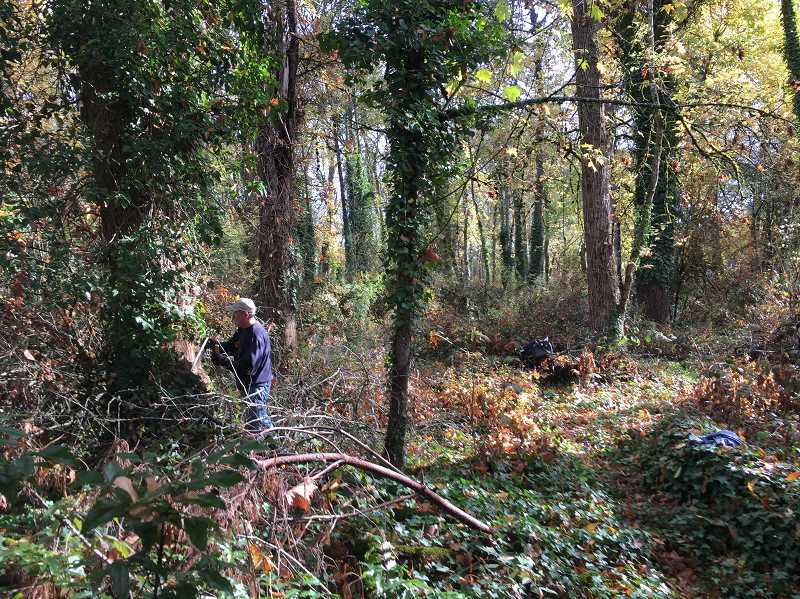 In collaboration with the City of Lake Oswego, the Westlake Homeowners Association and the Clackamas Soil and Water Conservation District (SWCD), the Oswego Lake Watershed Council (OLWC) has begun a project to restore the natural habitat and remove invasive species in the area. "Because it is a unique habitat and pretty sparse, the council and the HOA decided it was a worthy endeavor to push through restoration," says Patrick Blanchard, the OLWC's project coordinator. West Linn has its own restored oak woodland in the White Oak Savana. The OLWC got the idea for the restoration project from the Tualatin River Watershed Council, which focuses on habitat on the other side of Interstate 5. It then applied for a grant from the City and contacted the homeowners association. In the end, Blanchard says, the City contributed more than $39,000 to the project, the homeowners association contributed $30,000 and the Clackamas SWCD contributed $10,000. "(Invasive species) have been a problem throughout the Portland metro area," Berridge says. "We want to do our part to save the oaks and to restore the tract to its natural state." Blanchard says the Willamette Valley once boasted vibrant oak forests when the lands were occupied by Native Americans, but the oaks have thinned to just 5 percent of their peak numbers. In addition, he says, the trees in the oak woodlands area have particularly deteriorated since the homeowners association was established in 1988. "When that was done, this tract was left as open space, but there were no provisions made to manage it," Berridge says. Blanchard lists the encroachment of invasive species, most prominently English ivy, as the culprit. "People plant ivy because it's pretty. But it can jump a fence pretty easily, and if no one is checking it out, it can typically cause a big problem," Blanchard says. "There's a lot of ivy along the ground and a lot of tree ivy. Tree ivy is a big climber and can pull oak trees down, which is the opposite of what we want to happen." Blanchard says once invasive species and some of the plant understory are removed, the oak trees won't have as much competition for sunlight and will be able to more easily produce acorns, which is an important source of food for many animals in the woodland habitat — including the western grey squirrel, white-breasted nuthatch and large birds of prey, all of which are in decline, he says. "Once the acorns even reach the ground they have no way to germinate because ivy is taking the ground layer," Blanchard says. "We're hoping when the work is done, the oaks will be self-regenerating and produce acorns again." The project began in 2018 and will take about three years to complete. So far, the OLWC has enlisted a contractor to spray herbicide on the understory and the homeowners association has held work parties to remove some of the invasive species. The work parties take place from 10 a.m.-noon on the third Saturday of each month, including one on March 16. Blanchard doesn't expect much planting to be included in the project in the near term. "If we didn't see much species recruitment coming in, we would probably bolster it with planting. But that would be a couple years down the road," he says. Though he admits it has neglected the area in the past, Berridge says the homeowners association will continue to maintain the woodlands once the project is finished. "We have made a commitment to maintain it with an annual line item in the budget because the species will come back," he says. "Once we clear it out, it will be easier to maintain it."